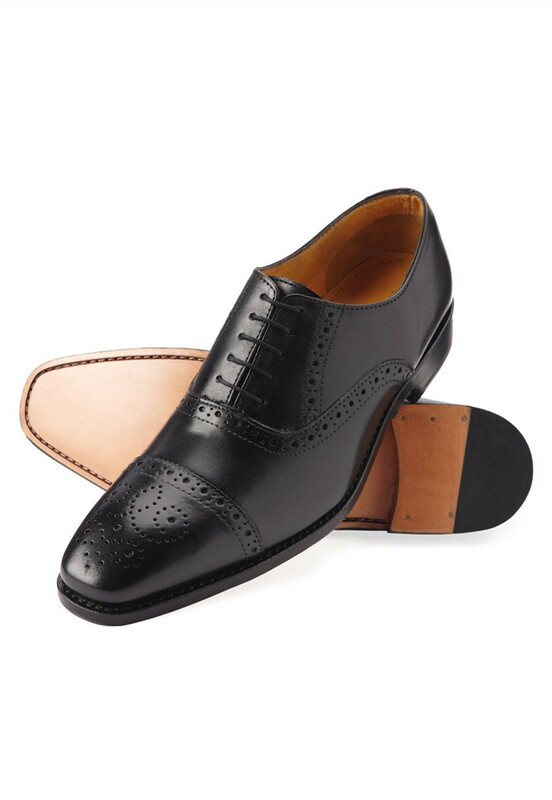 Brogue: Calf leather. Welted construction. F fitting. Leather sole. This was my second pair of leather brogues from you & they are superb. Immediately comfortable & a good fit I had to move up a half size - feet still growing - & that worked. Cost and delivery service were outstanding. Stumbled across them on the high street in Perth and bought a wool jacket and a pair of shoes in the sale at very good prices. Subsequently ordered a few things from them online and have been very happy - again the quality, fit and value are exceptional. Top quality merchandise at a reasonable price with service to match Ten out of ten. Corrected grain leather possibly msde in Loakes Indian factory (rather than in Northampton). Shape a little ugly, the last used for the Dublin would be better. Having said all that for £75 it offers those that only buy cheap shoes a chance to wear something better than what most high street stores offer. Good fit, well made, shame the laces are very different lengths! At £75 these shoes are a good buy, they seem to be well made and look good. That said, I wouldn't want to pay the £150 'list' price. Good material, made in England, leather sole. All for 75 quid: a stonking deal, to be honest. With shoes you have to really wear them in to test their quality; i've only worn these a couple of times. So far they are excellent value for money. I'll report back after a few months after i've had a chance to test them properly.. Superb value. Lovely soft leather. Better than other shoes purchased elsewhere at twice the price. A bit long in the toe area than I expected, but excellent quality. Good material, made in England, leather sole. All for 75 quid: a stonking deal, to be honest. With shoes you have to really wear them in to test their quality; i've only worn these a couple of times. So far they are excellent value for money. I'll report back after a few months after i've had a chance to test them properly..